But, since I love the kiddo, I oblige him. 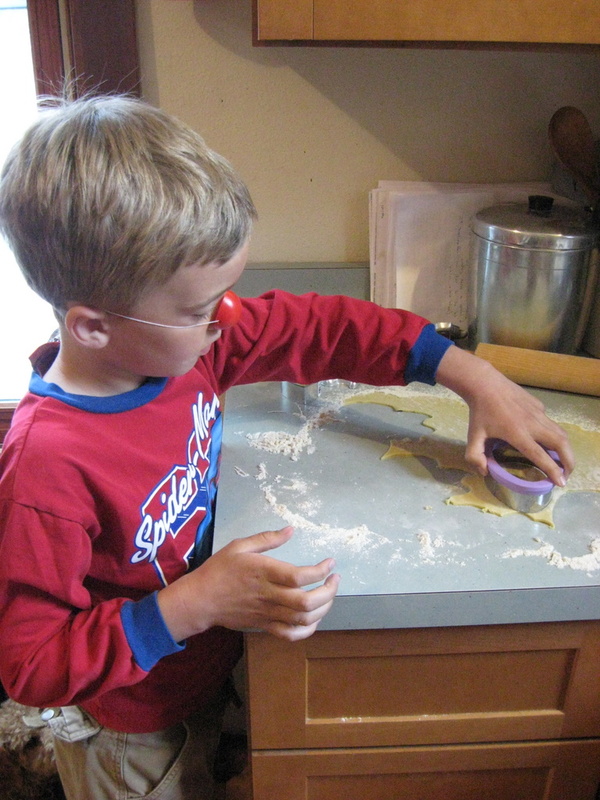 Most major holidays, and some minor ones (and some made up ones), you’ll find us in the kitchen rolling out sugar cookie dough. I roll; he cuts. That’s our deal. I’m also allowed to transport the cut cookies to the tray. But the cutting – that’s all him. So, when this gluten free thing came to be, I worried that I wouldn’t be able to find a recipe that would be kid-friendly enough. I worried that all the doughs would be too sticky and too fussy for a 7 year old to handle. Never fear. I headed on over to the Celiac forum and found this recipe posted by Shotgun41. I’m never content to just do things as written, and I don’t do dairy. So, I had to tweak it a bit. I was concerned about adding the milk. It seemed as though the dough was already going to be fairly soft and wet, and the only thing worse than rolling out something crumbly is rolling out something soggy. So, after subbing out Earth Balance for the dairy and dropping the milk and tweaking the process just slightly, here’s the recipe I wound up with. It was easy to roll and easy for the kiddo to cut out (though he did have to be slightly more careful than with other doughs). And shhhhh, don’t tell my son, but I kind of liked them. Just a little. 1. Cream shortening and sugar. Add eggs and vanilla. Mix well. 2. Whisk dry ingredients thoroughly and add to creamed mixture. 3. Chill at least one hour. and cut into desired shapes. 5. Bake on parchment-lined cookie sheet at 375 F for 7-10 minutes. 6. Slide parchment off of cookie sheets on to counter, and leave cookies to cool. 7. 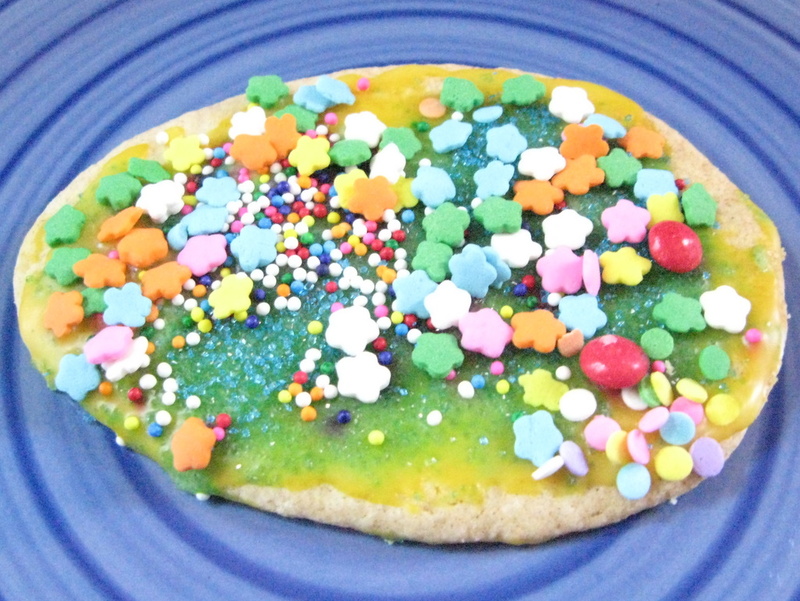 Frost, sprinkle with colored sugar or whatever you like. Judging by the performance of the palm sugar in the latest cut-out cookie, I think palm sugar would work just fine in this recipe as well. I’ve not tried it, but I don’t see why it wouldn’t. The texture might be slightly different, but I think they’d be fine. Let me know if you try it!